Determining percentage of overlapping lines using QGIS? i have a lines layer that represents the bikeways of my city, and also have another overlapping layer that represents the bikeways that need repairs. How can i get an analysis of the percentage or distance that needs reparing compared to the total length or 100% of the bikeways of the city? Make sure both layers are in an appropriate projected coordinate reference system (choose an equidistant or local state plane CRS), otherwise calculated lengths will be inaccurate. 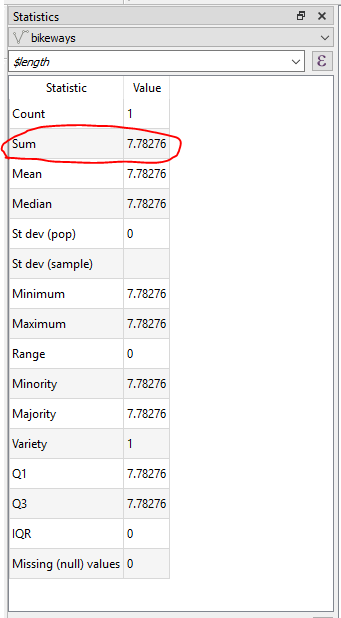 Open the Statistics panel, select the layer, and type in the expression $length. Record the "Sum" value. Repeat for the second layer. Not the answer you're looking for? Browse other questions tagged qgis line overlapping-features length or ask your own question. How to define polygons overlapping each other? Creating new lines along specifically selected existing lines using QGIS? How to merge overlapping and duplicate lines from vector layer to one single line? How to fix overlapping polygons using ArcGIS for Desktop? Deleting overlapping lines using ArcGIS Desktop? Calculate common length of two lines using ArcGIS Desktop? Calculating overlapping of lines using QGIS? Calculating line length within mulitple overlapping polygons using ArcGIS Desktop?